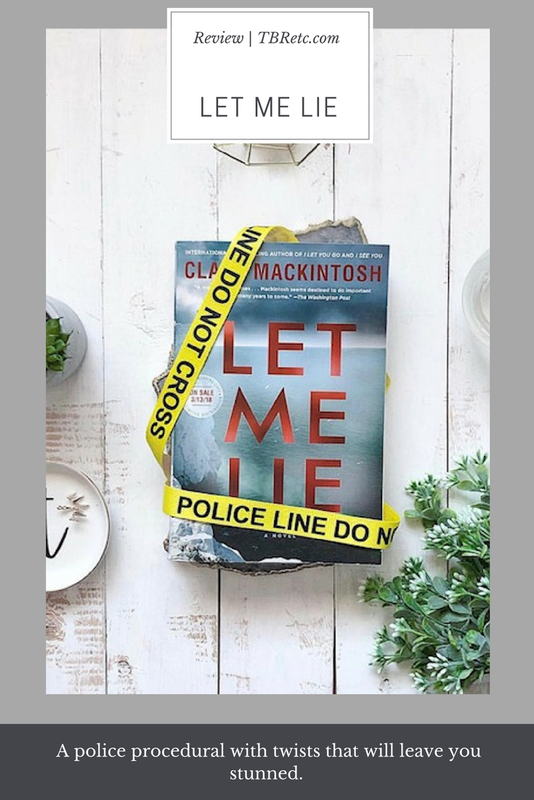 Review | Let Me Lie | Clare Mackintosh — TBR, etc. Why I read it: It's Clare Mackintosh! I loved the last book I read from her- I Let You Go - and jumped at the chance to pick up her new one. First Sentence: "Death does not suit me." We start out meeting Anna, a young woman who is learning how to be a mother while simultaneously mourning the loss of her parents. It seems that her father committed suicide, and, overcome by grief, her mother follows suit. Her partner, Mark, is supportive but he is getting used to his role as a first time father while also still getting to know Anna. The two weren't dating long when she got pregnant and their relationship got off to a strange start, seeing as he's her former grief counselor. I started off uncomfortable. This was a slow build and the beginning starts off so heavy. Anna's grief is palpable and the whole situation feels off. Then, on the anniversary of her mother's death she gets a card in the mail that says suggests that her parents' deaths may not be suicide after all. Panic-stricken, she takes the card to her beloved uncle, who immediately dismisses it. The police have long ago ruled out any signs of foul play, but she takes the card to them anyway and we meet Murray. Murray is a retired detective who still works at the station on civilian duty. He's still working because while he loves his wife and would like nothing more than to spend all of his time with her, she suffers from borderline personality disorder and is often in the hospital. He works as a distraction and because he can't quite walk away entirely. I loved reading about Murray and his struggle with transitioning out of the job. Murray and Sarah were my favorite characters by far. Mackintosh was so careful with her description of mental illness and I can tell Sarah's condition was added thoughtfully and with purpose and she discusses her mental illness with frankness and respect. Clare Mackintosh is a master at creating tension and crafting a compelling police procedural narrative. She's also a master at alternating viewpoints and creating shocking twists and I found myself flying through the book to get to the end. I was questioning everybody. Just as I thought I knew what was going on, another piece of the puzzle would fall into place and I'd be left guessing again. I will say, this is a slow burn that felt rambling in sections and by the end it felt like the characters got backed into a corner. I can't say much more than that without spoilers, if I'm being objective this wasn't my favorite by the author. Still, I would recommend you give it a try because of Murray and the cliffhangers, especially if you're a fan of the author or crime thrillers. It's entirely possible that my expectations have been set too high by her other books! Favorite Quote: "People liked boxes...You were ill or you were well. Mad or sane. Sarah's problem was that she climbed in and out of a box, and people didn't know how to deal with that." Have you read this? What do you think? Of course I love reading new books from my favorite authors but sometimes I struggle with writing reviews, especially if it's not a 5 star!